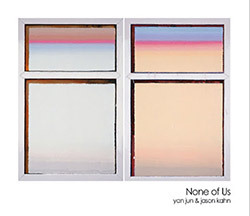 In 2016 Yan Jun and Jason Kahn went on tour as a voice duo, recording their concerts as well as the rehearsal beforehand. From these recordings they then excised all traces of their voices, leaving only the incidental sounds. An exercise in severe aesthetics provides us with a perfect forum for listening without the additional weight of meaning. It may be difficult to separate the sounds on this disc from any quotidian household sounds, indeed you may even forget that something's playing and be surprised to suddenly hear a foot shuffle or chair creak. Applause suddenly erupts during the concert recordings, and a short section is filled with after-show audience murmur. These edited recordings bring a couple of things to mind: the overall unimportance of human constructions when placed inside the big picture, the age-old assertion that there is music all around us constantly yet we most often ignore it. This album presents the perversity of undertaking an enterprise as involved as a tour of a foreign country, only to remove all traces of one's presence from the resulting collected souvenirs; or how the hunt for meaning often leaves the apparent unattended. I enjoy all of these ideas and yet I tend to forget them while the disc is playing, trying to pay attention to the almost-not-there. It is the perfect accompaniment to a soft rain outside and my cat scratching around in the cluttered corner of the room.